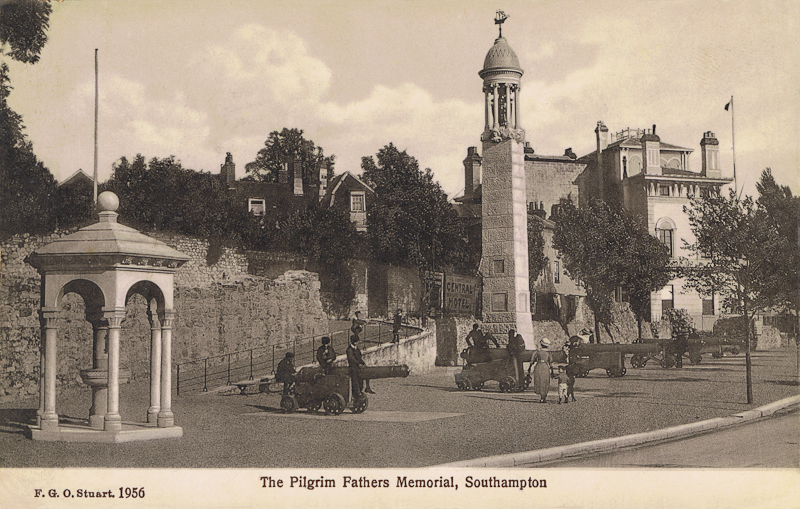 Erected on Town Quay in 1913 to commemorate the site from which the Pilgrim Fathers left for America in 1620 (although of course they put in to Plymouth as well), what was then a charming waterside location is now a busy main road. The imposing building in the background was the headquarters of the Royal Southampton Yacht Club, at the foot of Bugle Street. The smaller structure on the left is the Stella Memorial, c.1900, dedicated to the memory of Mary Anne Rogers, a stewardess on the Stella, who heroically saved the lives of several passengers when that vessel sunk.